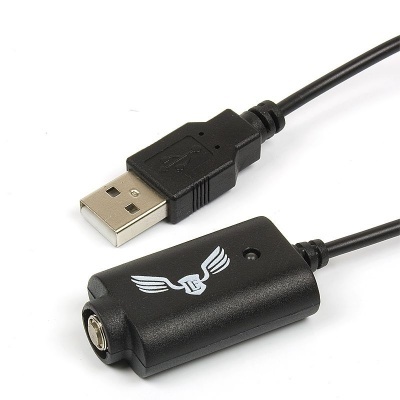 The Liberty Flights eGo USB Charger is a USB charging cable for the Liberty Flights eGo range of batteries. There is no point in having a battery if you can't keep it charged and the Liberty Flights USB Charger allows you to do this in the home or the office with ease. This ensures that you can get the safest and best possible charge for your Liberty Flights eGo battery. Thanks to fast charging technology, the eGo USB charger will charge the Liberty Flights eGo batteries incredibly quickly – the 650mAh eGo battery will charge fully in approximately two and a half hours, and the eGo XL will charge in less than three hours. This enables you to quickly charge your battery so you can get back to vaping faster. The eGo USB charger will charge from any computer's USB port, and can also be charged with the Liberty Flights USB UK Mains Adapter (sold separately). Please note: this product is only for use with the Liberty Flights eGo batteries, and should not be used to charge any other vaporiser batteries. The Liberty Flights eGo USB Charger should always be operated according to the manufacturer's instructions. Batteries should only be charged with included chargers or an official manufacturer's charger. Additionally, batteries should not be left unattended while charging and should not be left to charge overnight. Damaged batteries should be disposed of safely and in accordance with the law, and should not be used.